A mold inspection is the assessment of a building for the presence of water damage and mold that could be a potential health risk to occupants or a safety risk if the building is no longer structurally safe. While a variety of methods are promoted to inspect or “find” mold within a property, only one is scientifically effective at determining if mold exists, where it exists, what types are present, and what concentrations are present. Visual-Only Inspections – One of the most common mold inspection tactics to avoid is the free mold inspection that doesn’t involve the use of sample collection (testing) for laboratory analysis. A mold inspection must be including both the on-site findings by a mold inspector and the test results to be scientifically accurate. 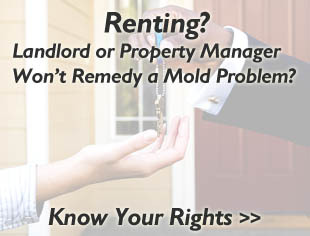 Mold is suspect until the test results are returned. If someone is telling you otherwise, they are lying. 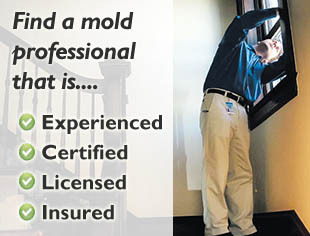 Free Mold Inspection – If a mold inspection is free, there is usually something wrong. If it’s free because they don’t conduct testing, see the bullet point above about “Visual-Only Inspections”. There are inaccurate. If it’s free because they don’t take air samples (including an outdoor comparison sample), just surface, you aren’t getting a complete assessment of your property. Make sure that your mold inspection includes testing of the air and that at least 4 samples are included. If you are being told otherwise, you are not talking to a true professional. Mold Sniffing Dogs – Everyday people and even environmental consultants claim that dogs that have been trained to sniff out mold are an appropriate substitute for a mold inspection with testing or for locating the full extent of a mold problem. While some dogs can be trained to seek out everything from drugs to mold, dogs cannot determine the full extent of a mold problem. Like a canary in a mine, they are an incomplete and inaccurate old world technique. A mold inspection should always include testing where samples are taken for analysis by a laboratory. This testing is combined with the knowledge of experienced and certified mold inspectors or remediation technicians to produce a full-scope assessment. This assessment will determine if mold exists, what concentration exists, and if the mold present is dangerous. While dogs are great friends, they cannot complete these critical steps. Why both a mold inspection and mold testing are needed? Which areas of the property (if any) have been impacted by mold? What the types of mold are present and are they are allergenic or toxigenic? Has the contamination cross-contaminated into other areas of the property? What is the moisture source of the mold? What action is recommended for problems found at the property (if any are found)? Finding the Right Mold Inspector: If you have decided that you would like to seek out a company that performs proper mold inspections, you can find a qualified company in your area here.